Two Banks of Four are producers Robert Gallagher a.k.a. Early Zinger & Dilip Harris a.k.a. Demus, two friends who have a long-standing passion of music, denim and Soviet constructivist design. Zinger was a former member of nu-jazz collective Galliano, who rode the wave of Gilles Peterson's wonderful Talkin' Loud label in the 90s, and more recently the force behind the many moods of Early Zinger, whose reggae rockers cover of Blur's "Song Two" was an underground hit on his own Red Egyptian label. Demus is a very respected London producer whose work includes the Young Disciples' debut LP, Ig Culture, Zero 7 and founding the Co-Op club. It all started in 1997 in an unheated flat in West London. The first few sessions were interrupted by power cuts and the heavy noise of trains leaving the city. They enrolled Valerie Etienne (former Galliano stalwart and recording artist in her own right) to become the leader of the vocal troupe, and she promptly recruited Paul Jason Fredericks and Bembe Segue to create a powerful trio of voices who would command the front of any stage. Their first long player, City Watching, received props from the likes of Gilles Peterson and Jazzanova, and was remixed by class-A music producers such as Herbert and Derrick L. Carter. The critically acclaimed second album, Three Street Worlds, came out 3 years later on Red Egyptian Jazz. During this time, Valerie Etienne and Zinger got to know the Jazzanova crew, and sang on "Mwela Mwela (Here I Am)" from Jazzanova's illustrious In Between album. They became good friends and it seemed natural that they should release their 3rd album on Jazzanova's Sonar Kollektiv imprint. 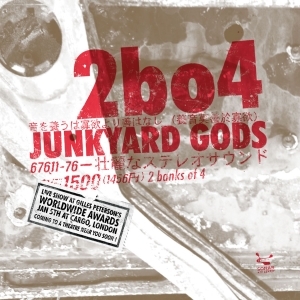 Junkyard Gods is an epic tour de force that cruises effortlessly through the twisted labyrinth of modern music genres - from soul to funk over to house and broken beat. Demus and Zinger put the emphasis on interaction and improvisation between all the musicians involved in the project, peppering it with their own electronic experimentations. This mix of influences, individual ideas and collective thinking is centred by Valerie Etienne, whose presence shines through the record from beginning to end. The whole album is a wonderful journey made of quirky electronic beats and sounds, flute solos, saxophone, trumpet and piano, strangely chaotic harmonies and intricate drumming sequences. It's easy to listen to, yet extremely rich and complex in its structure, with uplifting and energetic tracks such as "Paper Planes" and "Flags and Words" that could easily make it into the box of many a club DJ, poppy numbers like "Dead Afternoons" and "Queen of Crows", and more experimental tracks such as "Wake Me 5.30" and "Go", where electronic beats and layers of warped, dirty synths challenge musical logic. Junkyards Gods will teleport you kicking and screaming into another dimension of music. With Demus and Zinger as your space-captains and Valerie Etienne as your personal hostess, you can be sure you'll be taken on a trip that you've never heard before.